Researchers have documented five bacteria species carried by house flies that cause illness in humans, ranging from food poisoning to respiratory infections. In the current issue of Florida Entomologist, the researchers from the University of Florida describe collecting house flies near rear entrances and trash bins at four restaurants in Gainesville. About 20 flies from each location were collected in sterile containers and returned to the campus laboratory. The team used fatty acid analysis and DNA sequencing to identify a total of 11 pathogens carried by the flies—five of them not previously linked to house flies: Acinetobacter baumanni, Bacillus pumilus, Cronobacter sakazakii, Methylobacterium persicinum and Staphylococcus sciuri. 1. The findings reinforce the notion that fly control is key, especially around food sources, says Jerry Butler, a retired entomology professor who led the research team. “People need to know that there’s a reason for health requirements in restaurants,” he adds. “Most people have a good immune response, but there are those who are susceptible.” They include infants, seniors and people whose immune systems are compromised by illness or chemotherapy. 2. Fly control is a day-to-day battle because the insects are so mobile, traveling up to 10 miles in just a couple days’ time, Butler says. 3. Until this study, house flies were known to carry some 200 bacteria. But both Butler and researcher Jim Maruniak, an associate professor of insect pathology, says they expect additional research would turn up even more. “It just shows you don’t need a lot of flies to contaminate food sources,” Maruniak says. 4. House flies’ feeding preferences are particularly troublesome for humans because the insects are attracted to decaying plant and animal matter—materials often found in garbage and animal waste. “If it smells good to them, we probably want to hide it,” Butler says. 5. House flies must liquefy food before ingesting it, by placing spongy mouthparts on the food source and secreting saliva or regurgitated gut contents onto it. 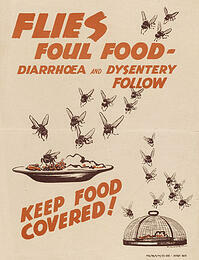 The pathogens that can hurt humans are spread by flies through the food-liquefying process or by defecation. There are many dangerous bacteria-causing illness which can be passed on through insufficient food preparation and lazy food storage which could be potentially life threatening. It is important that you know all the risks whether you work with food, manage a company which prepares or handles food, or indeed sells produce to the public. A string of sick customers will no doubt highlight your facility on social media and potentially create a very nasty and negative backlash on your business. If you work in or are a manager / owner within the food sector: no matter how difficult your customers may be - at the end of the day, they are the people providing you with an income and every care needs to be taken to ensure that you are taking precautions to reduce contamination. Strip doors and curtains which prevent flying pests from entering your facility as well as helping to prevent airborne bacteria, dust and deterring birds from entering. Yellow PVC strips are known to be the best solution for keeping flies away, as it is believed that flies avoid the colour yellow. High Speed Rapid Doors: the speed at which high speed rapid doors operate, mean that your exterior and interior doors are only open for a short period of time whilst vehicles and forklifts are going about their daily business. Compact Sectional Doors: which can be used in both wet and dry environments such as wash bays and / or refrigerated areas. Swing doors - both thermal and PVC swingdoors are used in butcheries and supermarkets alike and help to create a barrier to unwanted personnel as well as keeping the cool air (or warm air if your facility requires warm air) within the unit and help to provide a barrier against flying insects, rats, dust, bacteria and other pests. Air Curtains: very important! Air curtains can be installed at the entrance to your facility which provide a heavy downward wind which deflects insects as they are pushed downward in the wind force created by the air curtain and struggle to fly through the air pressure. Air curtains also help to prevent dust and other unwanted flying pests from entering your premises. Air curtains are effective in both small and large entrances such as shopping malls / retail outlets / convenience stores / cafes / takeaway shop / school entrances and so on - where there is an opening which cannot easily be closed off for long periods or is often opening to allow pedestrians access to the facility.